Posted on December 28, 2016 by Melissa Giannos wrote in Blog, Mobility Scooters Blog. Mobility scooters are powered by a rechargeable battery. That is why battery maintenance is of utmost priority here. If you don’t want your mobility aid to become a useless junk, you would need to pay attention to its batteries. To know about the battery type and maintenance, you can either ask the scooter dealer, or you may also check the manual where tips are usually provided. In some scooters, the batteries need to be completely discharged before you can charge it again, whereas with other scooters, you can charge as often as you would like. Cleaning is required not only to keep the vehicle looking good, but it is also necessary for keeping the vehicle in good shape. Make sure dirt, dust and debris do not get accumulated on the scooter. 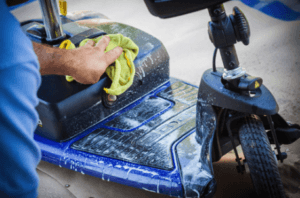 You can use a soft damp cloth to clean the exterior of the scooter. There are cleaners available for heavy duty cleaning. You can get these products for easy and quick cleaning. Don’t forget to clean the underside of the scooter and also the area around the battery terminals. As far as effective maintenance is concerned, keeping the mobility aid dry is crucial. You need to keep the vehicle protected from rain and extreme temperatures. You may at times need to keep the powered scooter outdoors, for example at carports. In such cases it would be best to best to keep the vehicle covered with a tarp. You may also need to invest in additional protective accessories. If you use a scooter that uses pneumatic tyres, you will need to keep an eye on the air pressure in the tyres. When the air pressure is right in the mobility scooter, your vehicle will offer you a smooth and safe ride both indoors and outdoors. Keeping the air pressure right will also increase their longevity so you do not have to change these tyres too early. If you have bought a used mobility scooter, you would have to pay more attention to its maintenance. If you have purchased the best brand of mobility scooter Brisbane, you would need to keep up with regular care and occasional repairs.